I typically carry about 145 pounds on my 5’2″ frame. That gives me a BMI of 26 — which is “overweight” according to the chart. But I’m also a competitive athlete so I seriously LOLed at this idea that I’m considered “overweight.” I’d need to lose 10 pounds to have a “healthy” BMI, but the only way I could pull off that kind of weight loss would be to lose a limb or ditch 10 pounds of muscle — neither of which is an acceptable option for me. 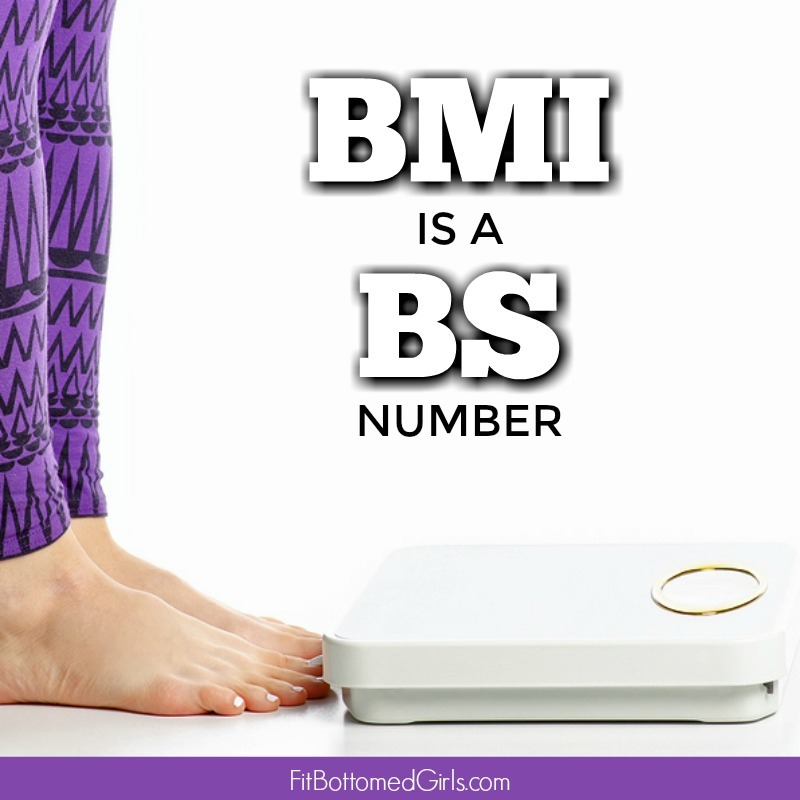 BMI is a BS number. Body mass index (BMI) has been around since the 1830s. It began as a simple screening tool to classify people and their risk for developing health issues. The idea is this: based on how tall you are, without any other information about you at all, BMI says there’s a certain amount you should weigh in order to be considered healthy. In other words, weight indicates health. Yeah, I call BS … for so many reasons. It’s a ridiculous oversimplification to say that you should weigh a certain amount based on your height. There are far more important factors to consider. With BMI, there’s absolutely no distinction made between a pound of fat and a pound of muscle — even though that certainly matters when assessing overall health. BMI also doesn’t take into account the differences between genders or ethnicities, nor does it consider where the fat is stored — which is important because it’s actually visceral (“belly”) fat stored around your abdominal organs that’s linked to increased health risks. Having body fat alone doesn’t make you less healthy. A 2016 study found that 54 million Americans had been classified as overweight or obese but were otherwise completely healthy in terms of cardiovascular and metabolic health. It also found 21 million Americans who were classified as “normal” but had poor cardiometabolic health. Fortunately, the general consensus now is that BMI simply cannot accurately predict health. But, as I found out recently, that sadly isn’t stopping doctors from calculating it. Once again, this proves that the number on the scale just doesn’t cut it when it comes to determining overall health and wellness. At some point, we really need to stop perpetuating the belief that “overweight equals unhealthy” and “normal weight means healthy” because neither of these statements are actually true. Health is a combination of many factors, and while weight can certainly be one of those factors, on its own, it’s generally a poor indicator of health, either way you look at it. For many years, it was numbers like BMI and the number on the scale that led me to make bad choices about my own health and fitness. I was afraid to eat more to boost my energy levels and properly fuel my workouts, or up my protein intake to add more muscle to my frame. I didn’t want to feel the shame of seeing the number on the scale go up despite all my best efforts to improve my health and fitness. So if you’ve got muscle on your frame or are otherwise actively engaged in a fit lifestyle (as we FBGs do), know that you can easily be cast into the “overweight” bucket … and it means absolutely nothing. In the end, no number — not your BMI or the number on the scale — has the power to define you or your value. We are far more complex than that. If you want to know if you’re healthy, talk to your doctor about other types of measurements you can use, such as blood pressure, cholesterol and triglyceride levels, blood sugar, family history, and physical activity. By following the wrong numbers, we may be shooting ourselves in the foot. This needs to stop. BTW, I’m still working on yoga pose “crow,” using your excellent “crow 101” video. I promise to tell you when I get up to 10 seconds. Barely at one second now (after like two years 😳), but feel stronger/more stable everyday! 60. The number of beats per minute my heart rate drops two minutes after exercise. This puts my heart in the “moderately younger than my age” category. 2. The max number of days in a row I haven’t exercised since January 2019. 3.5. The age of my son, who I can still pick up whenever he wants me to. 💪 I also bench-press him occasionally, just for giggles – his and mine. Heck to the yes, Rachel!!!! Agree, the best thing to ask if you are healthy or not is by going to your doctor. According to me, Keto diet is best for controlling BMI as it not only improve your cholesterol, blood pressure and blood sugar, but they also reduce your appetite, boost weight lss and lower your triglycerides. The healthier I get, the less I seem to care about the scale! As someone who works in the health care profession, I am often frustrated by the emphasis we place on it. I was just having a conversation with a patient the other day who has consistently been labeled as “overweight” on her chart, but she and I both know she is ALL MUSCLE (and her body fat percentage numbers prove it too- but we don’t seem to measure those in our clinics, do we?). If we are going to use BMI at all, we really should consider adding in other data points to help us truly understand a patient’s overall level of health. Until then, I am a huge advocate of everything you say here. Let’s all stop worrying so much about the scale, and instead focus on eating nutritious foods to fuel our bodies, getting a healthy amount of exercise, and feeling our best. Thanks so much for promoting this important point! Yes Alison, correctly said. In fitness, other than just considering BMI there are lots of other aspects, which need to be emphasized like body fat percentage, cardiovascular health, muscle growth, stamina level etc. Initially following BMI is ok but as proceed further BMI may depress you as I got then started following other aspects as mentioned earlier. Really good information by you. I have never really thought about how a BMI can sometimes alter your thinking of whether you are healthy or not. I’ve always had an idea to not look at the scale to much but for a long time I have been way to focused on my BMI and I think I need to take a deeper perspective into it and realize it can’t only determine whether I am healthy or not. Thank you Alison for those words of wisdom. I confess I haven’t completely given up my attachment to the number on the scale, but recently I’ve been paying more attention to my lean muscle mass and the size of the weights I can lift while maintaining proper form.